I love making brownies in a saucepan. It’s so much easier to clean up, and brownies are so forgiving, it’s hard to mess them up. 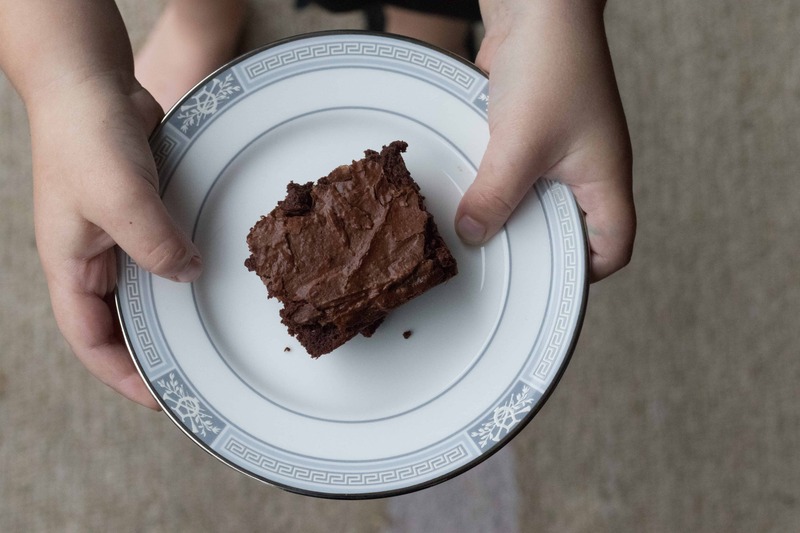 For this recipe, I broke the cardinal rule of food blogging – “Don’t let the kids eat it all before you take a picture.” Hence, we get one photo of a lone brownie on a plate with chubby baby hands. These decadent saucepan brownies are so good, they are always gone in a flash. However, they are SO EASY to make, I confess to making them more than once a week sometimes when we are craving something warm and chocolatey. If you are needing an easy dinner party dessert or a fun afterschool baking project with your kids, this recipe for decadent saucepan brownies is perfect. My kids love to measure out the ingredients and stir the batter. (And, of course, lick the batter after the brownies go in the oven…) These decadent saucepan brownies are great on their own or as the base for a beautiful brownie Sundae. Noelle and Keegan have made these brownies so many times, they decided to make their first cooking video to show you all how easy it is. So … don’t hesitate! Get in the kitchen and make these decadent saucepan brownies. OR, get your kids in the kitchen and have them make them for you. 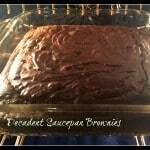 You can make decadent saucepan brownies in one pan and it takes just a few minutes to prepare! Preheat the oven to 350 degrees and grease a 9x9 or 8x8 pan. In a medium sized saucepan, combine the sugar and the butter over medium to medium low heat. Stir with a wooden spoon or heat resistant spatula while the butter melts. Add 1 cup flour, 1 cup cocoa powder, salt, and baking powder. Stir well. Add the chocolate chips or chocolate chunks and spread in a greased 9x9 pan. What a neat idea! I’d love to try this in an oven-safe skillet or Dutch oven and see if it worked with just one dish. Whats better than an easy clean up? These look divine. Ohhh, yessss, these look amazing! No one would complain about these at a party! Thanks, Kacey! These do go fast! I love brownies! These look so delicious! I have been CRAVING brownies for a while… haven’t made this style in a while! yum! My 11 year old made them tonight. We used M&M’s instead of the choc chips, delish! So great to hear that!! This is a great recipe for kids to make! What a great idea!! LOVE m&ms over here!